Want to learn Korean? Fascinated by its legendary grammar, or just want to understand BTS and BlackPink? Even if you’re just here for the k-pop, you can definitely study Korean on your own. 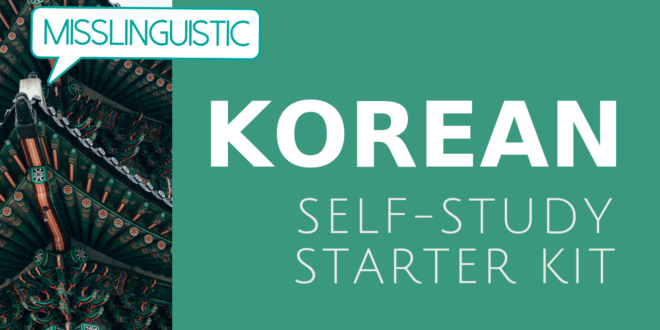 Here’s your free starter kit, everything you’ll need to fall in love with the Korean language: some online resources which I have found to be particularly helpful. Teaching yourself the Korean alphabet is EASY. There is no excuse not to learn it, in fact, it will be much harder to learn the Korean language if you try to stick to using the Roman alphabet, as the Korean language really doesn’t Romanize very well. Even if you are just learning Korean for a quick vacation to Korea, you should still learn Hangul! You’ll notice a few irregularities along the way, but mostly, it is an ingenious design. Here are some apps you can use to learn Hangul! Italki: There are dozens of excellent tutors for Korean on italki. Get $5 off using my link here! Mondly: This is a great introduction before you learn Hangul (the Korean alphabet), but oddly, the lessons use the Roman alphabet. There is no need for this, as Hangul is very easy, and in fact it is pretty hard to learn proper pronunciation if you use the Roman alphabet. So start with this, but transition to Memrise once you’ve learned Hangul! A great way to learn colloquial language. Seogang (also spelled Sogang) uses a textbook (they call it a Student’s book) that explains the grammar and includes everyday conversations, as well as a workbook to practice what you know. If you want to practice your language, here are some places you can go to find a partner! Hello, k-dramas!! Here are some of my favorite Korean dramas, and some that are not my favorite but are part of the K-drama canon so you should watch them anyway. Depending on where you live, try looking for them on Netflix, Viki, Tudou, Youku, or Youtube. Painfully, if you’re living in Korea, Netflix does not provide English subtitles for its Korean movies and tv shows. However if you’re living outside of Korea, you should be fine! Try looking for them on Netflix, Viki, Tudou, Youku, or Youtube. Have any more suggestions? Please leave them in the comments! I’ll update this post as much as I can as I come across new resources! The one textbook that saved me was “Korean Grammar In Use” you may know this already but since I didn’t see it on your list I figured it was worth mentioning. I have a lot of Sogang books but KGIU beats them hands down with their explanations.